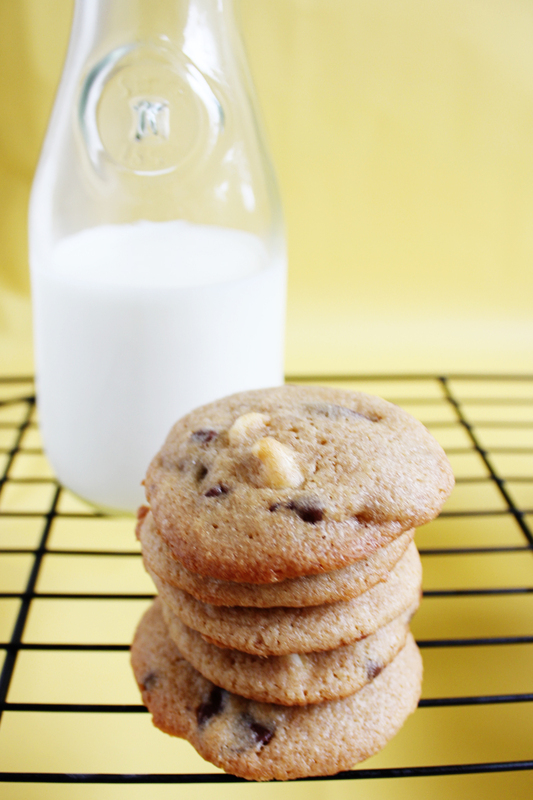 Grab a glass of milk and enjoy a stack of these soft, chewy triple chocolate chip cookies. 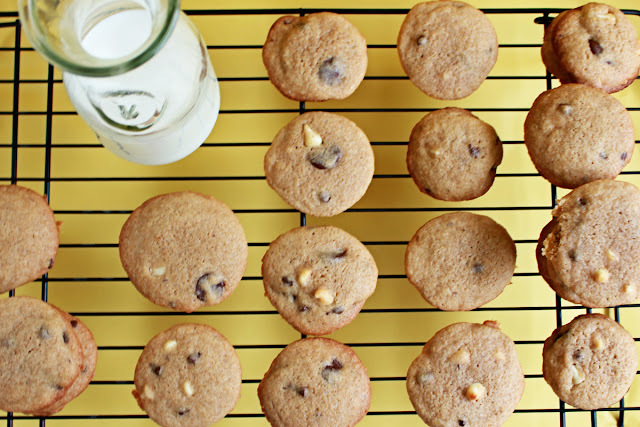 If you have been a reader of this site for long and had the chance to scan my index you may have wondered what’s the deal with the lack of cookie recipes on a baking blog? Until recently, I wasn’t much of a cookie fan. I’m not exactly sure what happened, as I told my husband – I think something must be wrong with me, his response was something must be right! Truth be told, I have made a lot more cookies than have ended up on the blog. I’ll be honest, I tend have some real issues with results – they are either too flat or too crisp. So today I am happy to share a recipe that really brings results, if you crave a soft, chewy chocolate chip cookie; then this is one to try. Warm from the oven, with a glass of cold milk, is definitely the way to go, enjoy and happy baking! Preheat oven to 350º and line two cookie sheets with parchment paper or baking mats. In the bowl of your electric mixer fitted with the paddle attachment, cream the butter and sugars; until light and fluffy. Add the salt, vanilla, and eggs; beat until well mixed. Next add the flour mixture and mix until just combined, then stir in the chocolate chips. Using a cookie scoop, drop 1 Tbs of dough about 2 inches apart onto your baking sheet. Bake for 8 1/2 to 9 minutes. Remove from the oven, and cool a few minutes on the baking sheet. Transfer to a wire rack, cool completely or serve warm. Store leftovers in an airtight container. These look super delish! Love chocolate chip cookies. I hope you’ll enjoy them as much as we did, no leftovers is always a good sign!